PRINCETON, NJ -- Just days after the Obama administration announced a series of proposals seeking more oversight of the salaries and bonus structures for executives at publicly traded companies, a new Gallup Poll finds that most Americans (59%) endorse government action to limit executive pay. There has been a great deal of public anger over executives who have received large paydays while their companies teetered on the brink of collapse and needed government money to survive. The most prominent example came earlier this year, when it was revealed that many top executives at insurance company AIG -- one of the biggest recipients of government bailout money -- were paid bonuses. In conjunction with the economic stimulus legislation passed by Congress earlier this year, the Treasury Department has put limits on the pay of executives at companies receiving federal bailout money; their pay plans must now be approved by a federal "pay czar" and their bonuses may be no greater than one-third of their total compensation. The latest proposals seek to go further and attempt to change the rules governing how executive pay is determined at publicly traded companies (including those that did not receive bailout money), shifting the power from company management to independent corporate compensation commissions and giving shareholders a voice in the process. Seventy-seven percent of self-identified Democrats favor the government's taking steps to limit executive pay, as do 56% of independents. More Republicans oppose (56%) than favor (42%) the idea. Older Americans are less supportive of the federal government's trying to encourage limits on executive pay. Those aged 65 or older divide about evenly, with 46% in favor of and 44% opposed to government intervention in executive pay. That compares with a solid majority of 63% support among Americans younger than age 65. Additionally, only a slim majority of upper-income Americans, 51%, favor government limits on executive pay. 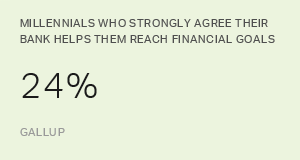 Support is higher among Americans at lower income levels. While some Republican elected officials see these latest proposals as another example of harmful government intervention in the private sector, Americans in general favor the idea of the federal government's getting involved to try to limit the amount of money corporate executives make. It is unclear whether this results from a general notion among the public that executives are paid too much, or whether it is tied to a sense that executives at poorly performing companies do not deserve high salaries, particularly companies that received federal bailout money. The Obama administration is trying to take an indirect approach by relying on shareholders and independent compensation commissions to reject exorbitant pay plans, rather than trying to set absolute limits on how much executives can make. Results are based on telephone interviews with 998 national adults, aged 18 and older, conducted June 13-14, 2009. For results based on the total sample of national adults, one can say with 95% confidence that the maximum margin of sampling error is ±3 percentage points. Consumers’ mood improved slightly last week, as did employee perceptions of job market gains and losses, but consumer spending is down from the prior week -- and down 29% from the relatively low spending levels of the same week a year ago. When asked about the actions that resulted in majority government ownership of General Motors, 55% of Americans disapprove. While only one in five Americans say they are likely to buy a new car in the next year, about half say they would be less likely to buy from a bankrupt automaker.